Now is apparently a good time to be in the market for a graphics card upgrade. We're seeing an unusual amount of sales, especially on AMD Polaris parts, which could mean that manufacturers and vendors are looking to clear out inventory in preparation for Vega. 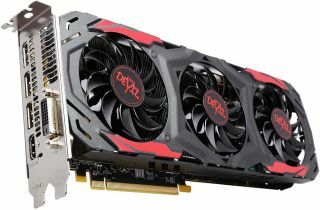 Whatever the case might be, you can snag Powercolor's Red Devil Radeon RX 480 graphics card with 8GB of GDDR5 memory for $200 after rebate. Today's markdown comes hot the heels of Powercolor's Red Dragon Radeon RX 480 with 4GB of memory going on sale. If you passed that one over only because of the amount of RAM, here's your chance to grab a card with the full 8GB at a discount. Once again, a mail-in-rebate is involved, this one for $20. That brings the cost down to $200, otherwise it's $220 if you don't want to fuss with it. The Red Devil card features a 6+1 power phase design. Powercolor says that each power phase provides 25W, compared to 22.5W from competing boards, which can help with overclocking. For cooling duties, the card is equipped with a triple fan cooling solution that Powercolor says offers 20 percent more airflow than traditional coolers. By centralizing airflow, the company also claims that dust buildup is less of a problem. Other amenities include a BIOS switch (toggle between Ultra Overclock and Silent Overclock modes), a backplate to prevent bending, and an 8-pin PCIe power connector to provide more juice for overclocking. Go here to grab the card on sale. If you don't like the Powercolor brand for whatever reason, Newegg also has MSI's Radeon RX 480 Armor 8G OC card marked down to $200 after rebate. You can find that one here.